Can you afford to have your business shut down for a month? If there’s one universal law of business, it’s that time is money. Every second that you aren’t working is a second you’re not earning revenue. Businesses today aim to avoid any and all interruptions, but that’s not always possible. Life is unpredictable and your business may need to close temporarily due to a major storm, fire, equipment theft or other issues that could occur at any moment, forcing businesses to stop producing until you things can get back on track. Restoring Lost Income: The main purpose of business interruption insurance is to reimburse you for income that you lose as a result of the interruption. To figure out how much this is, we will calculate the amount of revenue you earned prior to the disaster. 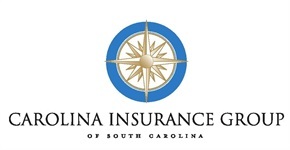 Then, a Carolina Insurance Group representative will subtract your ongoing expenses from the revenues you’re currently bringing in, and properly calculate your loss and what custom coverage you need. Covering Relocation Costs: Business interruption insurance also helps your business get back on your feet more quickly. Typically, this involves reimbursing you for the cost of moving to a new location, if you are unable to use your current workplace. The cost of business interruption insurance is directly related to your risk of experiencing the loss. For example, if you work somewhere that is highly vulnerable to fires or severe storms, your insurance premiums will be relatively high. 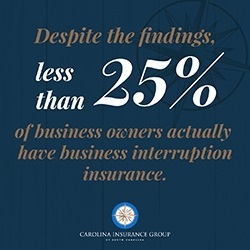 However, at Carolina Insurance Group, we look at your business and provide top-notch custom coverage. Most interruption insurance policies put a limit on total payouts. So before you buy, it’s important to estimate the amount of money you will need for interruptions over the course of time in your business. First, figure out what disasters or other sources of interruption are reasonably likely to happen and how often they tend to occur. Next, determine the daily cost of lost production and the total number of days you’re likely to be out of business. Finally, calculate the total cost of your probable losses and choose a policy that equals that cost. With the right policy in place, you’ll gain an enormous benefit for your business at a modest price. Even if your office is physically underwater, you can stay above water financially until you get things back to normal! Strategic Locations – Some businesses, such as restaurants, depend on access to specific sites. If a fire or storm damages your workplace, you can’t set up shop elsewhere while you wait for the building to be repaired. In this case, business interruption insurance is extremely valuable. Essential Equipment – Manufacturers and other companies depend on heavy, expensive equipment that isn’t easy to replace. If that equipment is stolen or damaged, you’ll need time to repair or replace it. 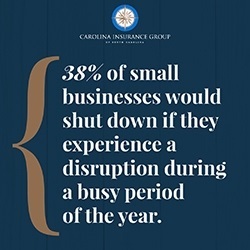 Business interruption insurance can help keep your business prospering in the ensuing down time. Vulnerable Sites – Some business sites, such as those in flood-prone locations, are likely to deal with business interruptions on a more regular basis. 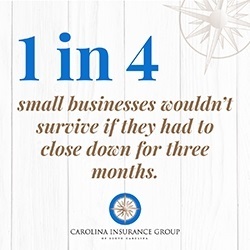 If this is the case for you, regardless of your industry, interruption insurance is a good investment to help keep your business above water.